Today has been a welcome day off from work, which has been horribly busy the past few days and so (predictably I guess) I spent the entire day in town shopping. I bought sock wool (I shouldn't have really, but it was so pretty and so reasonably priced) and even picked up a few Christmas pressies, so I guess all is good. It's been a tiring and cold day, with autumn here in earnest and outside it's becoming stormy, with the wind doing some vigourous shaking of the trees out there. To round the day off, a posting I was intending to write a couple of days ago but just haven't got around to. 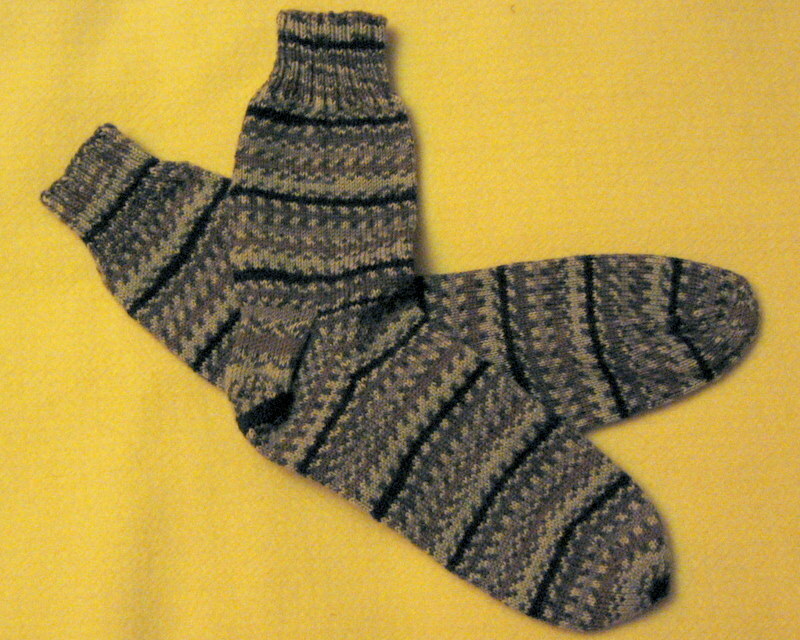 I finally finished the socks I cast on to take on the weeklong AscendancyLRP game back in August. Here they are modelled by Dave, but intended as a Christmas present for my father. 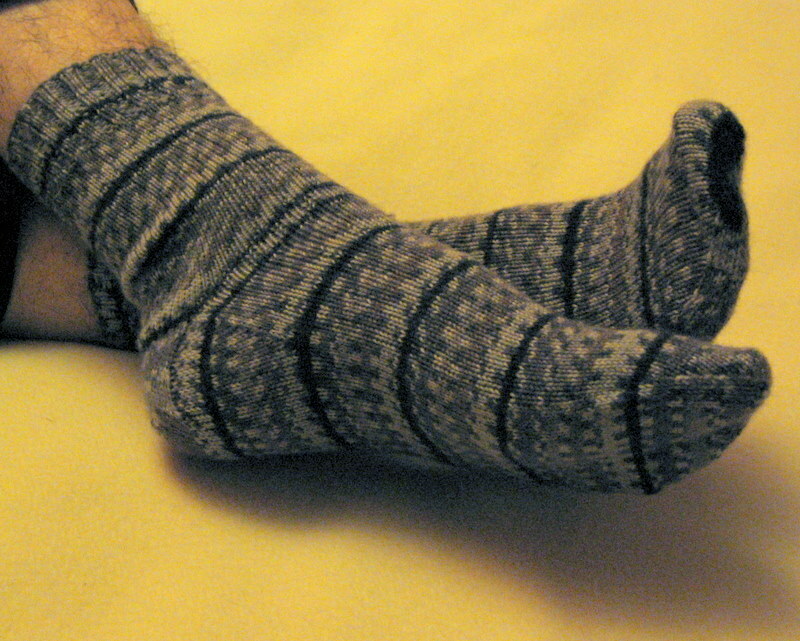 This is a plain sock knitted as per the basic sock recipe from the Yarn Harlot and detailed in Knitting Rules!. As such, there isn't a real pattern as such, I just worked on my guage (7 stitches per inch, slightly stretched on 2.5mm needles) and since my father's feet are about the same size as Dave's, used his feet as the guide. These are knitted in Regia Jaquard 4-ply, colourway 5175, which as you can see is a sort of charcoal grey. I'm still in shock at how long its taken me to knit these socks and I really don't have an excuse for why. I'm currently putting it down to having too many projects on the needles at the same time and not enough hours free to indulge in knitting. Anyway they're done now and I'm pleased with how they came out. I think your dad will like the socks, I do, but whether he appreciates the hours that go into them I'm not sure.